"Hank Cooper pretended an average bull rider, going from town to town trying to get those elusive eight seconds. But when he and his best friend, Sam, come to the cowboy town of Clovis, California, he meets a woman destined to be his. Hank can’t run away from what he is any longer, but will she? Tammie Flint is just a girl who wants to have a good time at the rodeo with her best friend--maybe even meet a few cute guys. She didn’t expect to fall in love with a cowboy or to put the lives of everyone she holds dear in danger. 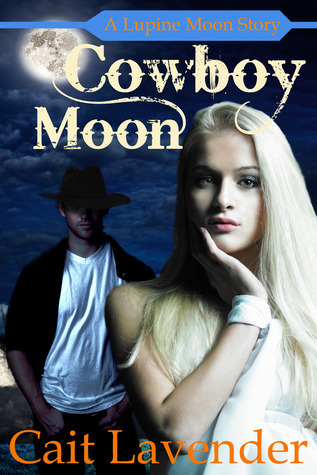 Will any of them survive the Cowboy Moon?" Just a warning...this is a short story, so the story is rather, well, short. This review may be short as well. Also this is the "prequel" to Hunter Moon, which I already read. I would advice to read Hunter Moon first, but in the end it doesn't really matter. This is the story on how Hank and Tammie met. It was really cute, but very quick. Tammie and Hank fall in love right away at the bar one lovely night. Also Hank's buddy Sam falls in love with Tammie's gal pal, Denise. It was a nice touch that both boys found their "soul mates", but it did irk me on HOW quickly they fell in love. They all knew each other for like 3 days and that was it. It didn't feel realistic...but it is a short story and people in short stories fall head-over-heels quickly. In the end, I really like Cait Lavender and I can't wait for the sequel to Hunter Moon to come out. This was a nice filler until she gets the other book done. It was quick, sweet, and had me for a loop. I would recommend to those that like werewolves and all that fantasy stuff. Also, I would say to read Hunter Moon before diving into this, but it really doesn't matter. I shall stamp this with 3 stars. Favorite Character(s): Hank, Sam (awwwweeee), and Denise. Oh neat. Sounds like a good start to the series. :) Thank you. Melissa, it is. :D You should check it out.